Disaster can strike at any time. And since we can’t always determine when or where an emergency will happen, you and your family must be prepared. Unfortunately, according to FEMA, nearly 60% of American adults have not practiced what to do in a disaster and only 39% have developed an emergency plan. It’s vital for your family to know how to respond to any situation, and a great tool is a home emergency plan. A home emergency plan can keep your family members on the same page, help you reach safety and minimize panic and chaos. To help you get started, here are our top tips for creating a home emergency plan. 1. Consider your unique needs. Where you live and the specific needs of your family members are major factors to consider in your home emergency plan. Know what natural disasters could occur in your area and how best to prepare for emergencies like hurricanes, severe flooding, volcanoes or tornadoes. In addition, determine if you need to make special accommodations for certain family members, such as senior citizens, family members with disabilities, infants and young children. You should also take into account medical and dietary needs of all members of your household. 2. Make a disaster supplies kit. 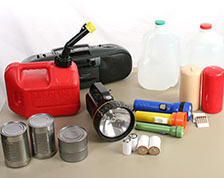 A disaster supplies kit is a great way to have everything you need in one place so you can quickly evacuate. Ideally, your kit should fit in one or two easy-to-carry bags and should contain items to help you survive on your own for at least 72 hours. The Department of Homeland Security recommends that you include these items in your disaster supply kit. Once a year, review what’s in your emergency kit. Replace expired items and update what you’re bringing along as your family’s needs change. 3. Know where to go. Every emergency is different, so your safe space will vary by situation. First, find safe places in your home for every situation where you would need to take shelter, like an earthquake or tornado. Second, find a meeting spot right outside your home in case of a fire or other sudden emergency. Third, determine where you would go if you were asked to evacuate or could not return home, and plan the route you would take to get there. Create a family communication plan. The plan should include information on how you will receive local emergency alerts (radio, TV, text, etc. ), as well as information on how to keep in contact with each other. Make sure all family members have emergency phone numbers saved in their cell phone and written on a contact card. Include numbers for each family member, the police station, a nearby hospital and an out-of-area emergency contact. It may be easier to reach someone out of town if there is an emergency affecting your neighborhood, so it is wise to designate an out-of-area contact. Instruct all family members to keep in touch with this emergency contact to let them know that they are safe. In addition, if there is a disaster in your area, you can mark yourself safe on Facebook or register on the American Red Cross Safe and Well website so your loved ones know that you’re okay. When planning for an emergency, don’t forget about your pets! Create a list of pet-friendly hotels and animal shelters along your evacuation route. Also, remember to include items for your pet in your disaster kit. 6. Write it down and practice. Make sure you get your emergency plan down on paper with detailed instructions for each situation. How you react to a tornado will be very different than how you react to an evacuation, so you must have a plan for each one. Plus, there are many online resources to help you document your plan, like this form from the American Red Cross. Practice your plans twice a year. For evacuation drills, you should even grab your emergency kit and drive to your evacuation route. Before a disaster strikes, it is smart to review your insurance policy with your agent to make sure you have the right coverage for risks in your area. For instance, a standard home policy typically doesn’t include protections like flood insurance or earthquake coverage. You also should make sure you know how to file a claim, if necessary, whether through your carrier’s loss reporting phone line or website, or through your agent. While you may not know when a disaster will strike, with a home emergency plan, you can rest easy and know that your family is prepared for whatever comes your way. This article is for informational and suggestion purposes only. To learn more about Grange’s auto, home, life and business insurance, speak with your local independent agent. If the policy coverage descriptions in this article conflict with the language in the policy, the language in the policy applies. 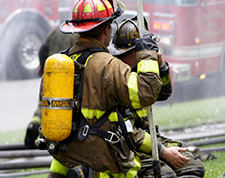 Did you know that you may only have about two minutes to safely exit your home during a fire? It’s time to create and practice a home fire escape plan to keep you and your family safe. Nothing can be done to prevent or control natural disasters and other catastrophes once they happen. What you can control is being ready by thinking ahead - and assembling these items.